The hottest product in "drop-in" LED replacements! Technology Associates, Inc. introduces MagmaLED-T2! 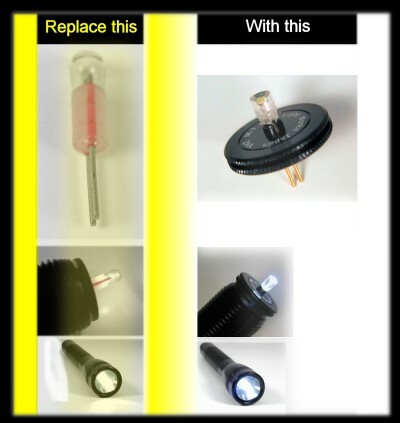 The only white LED drop-in replacement for the Mini Maglite(r) flashlight which makes use of Maglite's quality reflector for beam control. 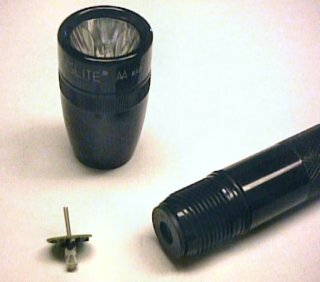 MagmaLED simply replaces the standard Krypton bulb in your AA mini maglite giving you all the benefits of a quality white LED flashlight plus the benefits of the mini maglite design. You can still keep the spare Kryton Bulb in the base of your unit giving you a the flexibility to change configurations as needed. NOTE: Mag Instrument, Inc., which manufactures and sells the Mini Maglite(r) AA flashlight, is not related in any way to Technology Associates, Inc. Mag Instrument, Inc. does not make, warrant, sponsor nor endorse the MagmaLED(tm) drop-in replacement product advertised here. Use of the Mini Maglite trademark, a registered trademark of Mag Instrument, Inc., is only for the purpose of identifying the flashlight with which the advertised product is designed to work. The MagmaLED-T2 produces about 1/2 of the measured light of your standard krypton bulb. But, it only consumes 2/3 or less of the power giving you usable light from 15 to 60 hours on standard AA alkaline batteries. Your standard bulb will only give you 4 to 8 hours of usable light. If the math doesn't make sense here, that's because LED technology can use MORE of the battery than incandecent bulbs can. And, the MagmaLED-T2 produces a whiter more evenly distributed light which is more usable to the human eye. Finally, forget having to replace that bulb constantly! The MagmaLED itself will last a thousand hours or more compared to a fraction of that on your krypton bulb. Start seeing the benefits of 21st century lighting technology in your 20th century flashlight! 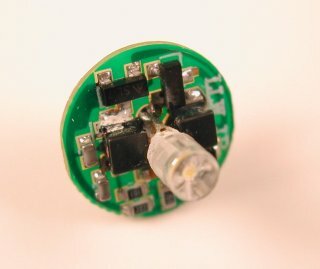 MagmaLED's tiny circuitry converts the power in your standard Mini Maglite(r) AA flashlight to drive the new generation of WHITE LED light sources. Only designed for Mini Maglite(r) AA model. Will not fit or function in any other model. Designed for use with ALKALINE batteries only! Use of Lithium batteries may damage or severly shorten the life of the MagaMED-T2. Technology Associates, Inc. (TAI) warrants that all VersaLux products shall be free from defects in material and workmanship under normal use for a period of 30 days from date of shipment. Products covered by this warranty shall be returned to TAI within the warranty period and upon examination TAI determines to its satisfaction that such product is defective in material or workmanship and such defect was not caused by accident, misuse, improper installation, improper adjustment, improper repair or improper testing, TAI shall at its option, repair or replace the product. Shipping charge is at buyer's expense. TAI shall have a reasonable time to make such repairs or replace such equipment. TAI's general turnaround for warranty repairs is 1-2 weeks. Buyer must include all documentation relating to the shipment, purchase and nature of the failure. The Buyer is responsible for packaging the returned material in an appropriate container in order to protect against shipping damages. TAI does not warrant merchantability for any purpose, and shall not be liable for consequential damages of any kind, however incurred. This limited warranty applies only to the original purchaser of the product, and is not transferable. Refund: If VersaLux products shall be returned to TAI for refund and upon examination TAI determines to its satisfaction that the product being returned has not been used or altered, TAI may refund full purchase price, less shipping cost, within 30 days from the date of purchase. Sorry, no refund after 30 days. Mini Maglite is a registered trademark of Mag Instrument.